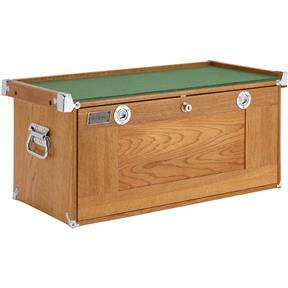 This Oak Tool Box is one of the nicest we've ever seen anywhere! With lots of storage options, it's ideal for keeping and protecting your fine tool bits, measuring tools and machine accessories. Features beautiful face veneer over stable center core construction, interlocking joints, felt-lined drawers and front panel. You won't be disappointed! Approximate shipping weight: 45 lbs. I simply love it! It helps me keep my small repair parts organized! 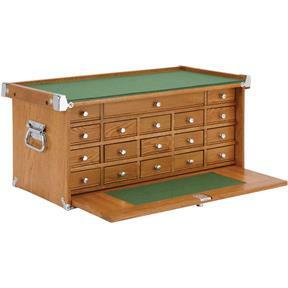 I ordered this about six weeks ago and I am completely satisfied with the tool box. The product was delivered in a timely manner and was well packaged. If you are looking for a well made tool chest to keep your fine tools organized and well stored, you will be well pleased with this or any other tool box offered by Grizzlfy.